The Arizona startup has signed up suppliers for two key components of its SunCatcher, which uses the Stirling engine to generate electricity. One year after receiving a life-sustaining investment from investment firm NTR, Stirling Energy Systems (SES) is on track to start mass producing equipment for its solar thermal power equipment in the second half of 2010, said an NTR executive. The production schedule would enable SES to supply parts for a 750-megawatt power plant in California's Imperial Valley that is estimated to cost $2.2 billion to build, said Michael Walsh, the finance director for NTR, during an interview in San Francisco this week. NTR, a Dublin firm that was founded in 1978 to build and operate toll roads in Ireland, took a $100 million bet on the Scottsdale, Ariz.-based SES in 2008 as part of its strategy to invest in the renewable energy market in the United States. The 41 percent equity investment gave NTR a 51 percent controlling interest in the company. Since then, Walsh has jetted frequently across the Atlantic to shepherd SES's progress toward commercializing its technology, which makes use of a 40-foot wide parabolic dish of mirrors that concentrates the sunlight onto a receiver called "power conversion unit." Sunlight heats up the hydrogen gas in tubes in the PCU, and the gas runs through a heat exchanger to power a four-cylinder Stirling engine. The engine then drives a generator to produce electricity. SES envisions erecting hundreds of these systems, called SunCatchers, in the desert of California and the Southwest to generate electricity for sale to utilities. The company retooled the SunCatcher and unveiled the improved version earlier this year (see Stirling Redesigns SunCatcher, Plans 1.5MW Demo). SES has lined up suppliers for the two key components of SunCatcher, Walsh said. Just earlier this week, SES said Linamar (TSX: LNR), a Canadian automotive parts maker, would produce the PUC. Last month, SES said it had inked a deal with Tower Automotive in Lovonia, Mich., to assemble the mirror facets. Walsh said the big challenge for SES hasn't been the technology development, but the unsexy, nitty-gritty task of finding the right suppliers. "It's complex to build a supply chain from scratch, and that's what we've been doing in the last year," Walsh said. Walsh, who also checks on NTR's wind and recycling investments in the United States during his travel here, said SES expects its suppliers to start mass production in the second half of 2010 and roll out 40,000 units per year. Walsh declined to disclose the financial terms of the supply agreements, but said the companies are seeking federal grants for retooling factories to make renewable energy equipment. SES would sell the equipment to Tessera Solar, the project development company set by SES earlier this year. Tessera has taken over the projects that SES had worked on since its inception in 1996, and is now developing more than 1.5 gigawatts of projects. Electricity from the 750-megawatt project in California's Imperial Valley would go to San Diego Gas & Electric. The project has faced delays and is still undergoing the permitting process to secure federal and state approval. Tessera officials are hoping to secure the permits by next spring. The company is applying for a loan guarantee from the U.S. Department of Energy to offset half of the cost of the $2.2 billion project, Walsh said. NTR would help in raising the additional funds to pay for the rest of the project. Tessera plans to build the project in phases, starting with 150-200 megawatts, Walsh said. Finding adequate financing is a big hurdle for solar thermal power developers to overcome, and it's not just because the economy is still in recovery. Starwood Energy Group Global and Lockheed Martin nixed a power sales contract with utility Arizona Public Service this week after Lockheed determined that the cost for building the 290-megawatt power plant would be too high (see Starwood, Lockheed Cancel 290MW Solar Project). Starwood and the utility signed the deal only in May this year. Elsewhere, utilities such as the San Francisco-based Pacific Gas and Electric Co. have signed gigawatts of contracts to buy solar power. 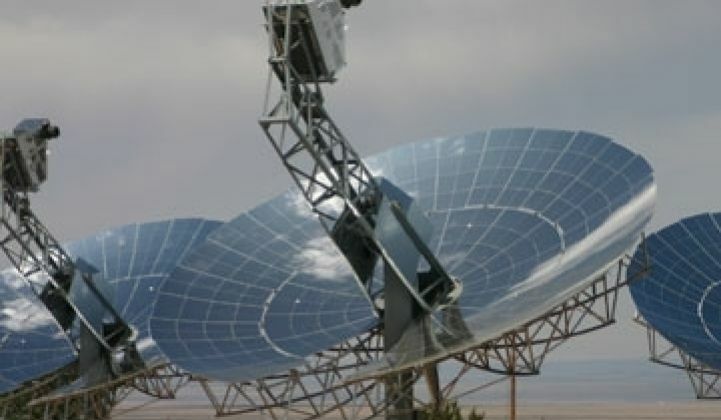 One of its solar thermal power suppliers, Oakland, Calif.-based BrightSource Energy, is set to start construction in early 2010. But it only recently began to disclose how it would finance a 440-megawatt project in California's Mojave Desert. BrightSource has lined up San Francisco-based engineering firm Bechtel as a project investor and general contractor (see BrightSource Gets a Big Brother in Bechtel). Tessera also is under contract to build an 850-megawatt power plant to sell electricity to Southern California Edison. Image via Stirling Energy Systems.